Yesterday we talked about Your Brain on ADHD and how poor Executive Functioning skills can make things harder for you. In fact, many of the problems associated with ADHD are directly related to Executive Functioning skills or rather, a lack of them. 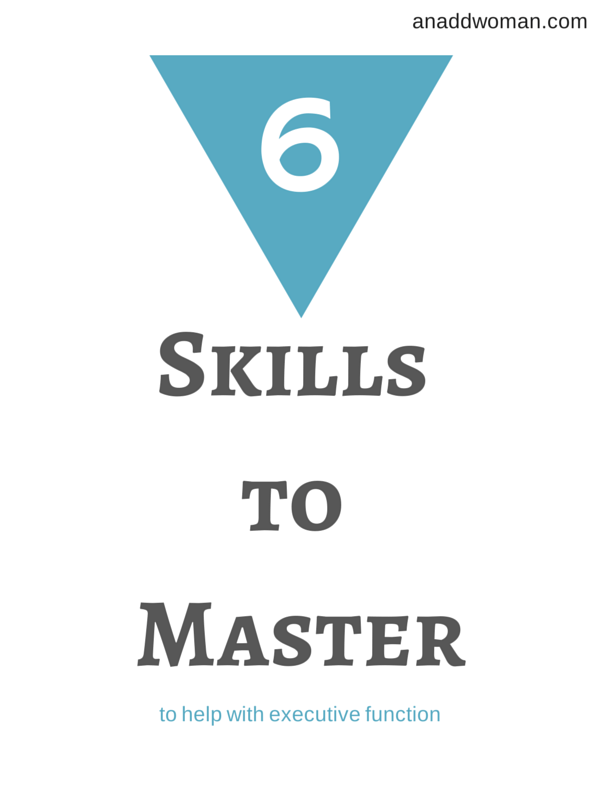 Today let’s talk about 6 skills to master to help you compensate for your problem areas with Executive Function. Each of these skills relates to one of the six facets of executive function. Eat the toad first. Activation, or getting started, is often stalled by procrastination and perfectionism. Eating the toad first means you do the most distasteful thing first so that it’s out of the way. And remember, done is better than perfect. Remove distractions. In order to achieve focus, it is important to weed out things that might distract you. Turn your phone off and leave it in another room. If electronics are not part of the task, turn them off. Turn on some classical instrumental music to help engage your right brain – the side that tends to want to play rather than work. Set a timer for 15 minutes and go to work. Sleep well. Getting enough quality sleep is one of the biggest things you can do to improve effort, or your brain’s processing speed. Make your bedroom only about sleeping, not watching TV or going online. Make it comfortable and inviting. Figure out how much sleep you need to function well and then add a little time in to allow for falling asleep. Establish a bedtime routine that helps you wind down and turn your brain off. Journal. Many of us with ADHD have a hard time pushing our emotions out of the way so that we can function. Writing down your thoughts and feelings help you express them and get them out of your system, giving you more control over the task at hand. Train your brain. Poor memory is a huge problem for those of us with ADHD. Use your downtime to play brain exercising games in order to improve your memory and help you stay sharp. Learn to live in the moment. Most people with ADHD either live in the past or the near future, thereby missing what’s going on here and now. When that happens, you miss social cues, interrupt when you shouldn’t, and act impulsively. When you find yourself wandering, stop and notice what’s going on right now. What do you hear, see, smell, feel, or taste? Learning to live in the moment is a wonderful skill to have because it brings your life back to you and can even solve some of your ADD like problems, like misplacing your keys. Do you have to learn all of these? Choose the one that would help you the most and work on that. These are life skills, meant to be learned and refined over and over.